Many chefs who shop at the farmers market have discovered sprouts and microgreens, and use them to add complexity and subtle texture to their dishes at restaurants like State Bird Provisions, The Progress, Rich Table, Boulevard, and Perbacco, to name a few. But casual shoppers are often unfamiliar with the different types of sprouts and microgreens and their health benefits and culinary uses, which makes education key. “When they grow the second set of leaves (known as ‘true leaves’), we label them as microgreens,” he continues. “We grow both, because different plants are tastier or more nutritious at different stages.” While both sprouts and microgreens start as germinated seeds, sprouts are harvested after just a few days and the entire plant (seed, root, and shoot) is consumed. Microgreens are grown for longer, typically 10 to 14 days in soil or a growing medium, and are cut when ready to eat, leaving the seed and root behind. Both are incredibly nutritious, containing more vitamins and carotenoids than mature plants, sometimes 5 times more, according to Moira Kuhnof Marin Roots Farm, which sells most of their sprouts directly to chefs. A few shoppers are wary of sprouts due to worries and misconceptions about their safety. Commercially grown sprouts, both domestic and foreign, have been implicated in “sproutbreaks” in the past, typically harboring Salmonella, but also Listeria and E. coli. The warm, moist environment that sprouts thrive in is also friendly to bacteria, so when a sprouts operation has poor sanitation practices, an outbreak can occur. However, the scale and severity of most outbreaks has been exaggerated by media coverage, according to Jim. He further asserts, “No small-scale sprouter has ever had an outbreak.” Growing on a smaller scale, like the operations at Brooks and Daughters and Marin Roots Farm, greatly reduces the chances of contamination by allowing for more extreme control and attention to safety. Ultimately, it is up to shoppers to decide whether they are comfortable with the risks of eating sprouts. When shopping, avoid sprouts with a musty smell or slimy, milky appearance, and always refrigerate your sprouts when you get them home. 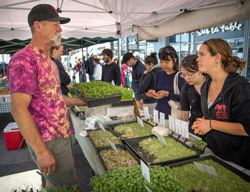 Sprouts and microgreens can be grown from legumes, grains, vegetables, and herbs, and one of the best ways to learn about the flavor and texture differences is to sample the variety on offer at the farmers market. 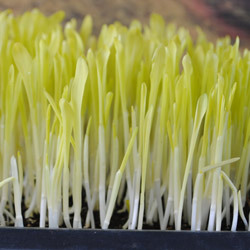 The most common type of sprout is alfalfa. A sweet and mild sprout, alfalfa is high in protein, calcium, B vitamins, vitamins C, D, E and K, and phytoestrogens (plant compounds that help lower the risk of heart disease, cancer, and osteoporosis). It also has small amounts of calcium and potassium. This sprout is delicious on its own, but is also great in combination with other, more strongly flavored sprouts. At Brooks and Daughters, alfalfa and clover, another mild tasting sprout, are used as the base for several popular salad mixes. Fenugreek is one of the heartiest sprouts that Brooks and Daughters sells, with a texture like a bean sprout and a subtle bitter flavor. A legume that is rich in iron and used medicinally to cleanse the lymph system, fenugreek seeds are a staple in many Indian dishes. It has also been well documented that eating fenugreek can make you smell like maple syrup, so don’t be alarmed if you exude a sweet scent after sampling. Another favorite sprout is broccoli, which packs a full broccoli flavor (with a hint of spiciness) into a much more delicately textured plant. Broccoli sprouts are loaded with vitamins and minerals. While microgreens are older and therefore sturdier than sprouts, they also have a range of flavors, textures, and nutritional benefits. 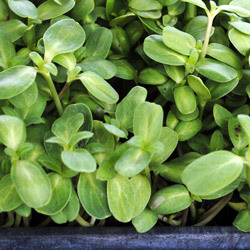 Sunflower microgreens, a favorite of many chefs at the Saturday market, are crisp, with a nutty and fresh taste. They are high in protein, fiber, calcium, magnesium, phosphorus, and essential fatty acids. Another popular and vitamin-rich microgreen, available by the bag at Brooks and Daughters and by the flat at Marin Roots Farm (when in season), is mustard microgreens. They are delicate in texture, with a spicy kick. A common question from shoppers after they have tasted sprouts and microgreens is how to use them. As one might guess, they are wonderful in salads, but that’s only the beginning. Sprouts and microgreens are great sprinkled on cooked foods like vegetables, grains, and meats, and a lovely addition to smoothies, sandwiches, and wraps, or even mixed with yogurt (a favorite of Jim’s). The addition of a spicy radish sprout, for example, might add punch to an otherwise mild dish, while a tender cilantro microgreen delivers a much more subtle flavor than the mature plant. Many customers, unable to resist, open up their bags and simply munch on the fresh, crisp, flavorful greens or sprouts immediately after purchase. Find Brooks and Daughters and Marin Roots Farm in the back plaza on Saturdays. Jim Brooks photo by Gary Yost Photography.